It’s Earth Day and Good Friday today, so when I got up this morning I felt it was going to be a good day for a colon cleanse. One, I don’t have to work so can be at home. Two, not turning the dehydrator, or the blender, or the food processor on for a day must be good for the earth. Three, I feel like it’s a good gesture to give up food for the day, being the season and all. Four, I had bread last week so am feeling a little bloated and gross. Five, I said I’d do it four times a year and missed the start of Spring. Six… it’s simply important to love your colon!! To start, I want to apologize for those of you who weren’t expecting this sort of discussion on my blog. 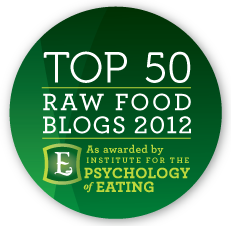 I am deliberately staying away from ‘educational’ pieces about raw foods, nutrition etc. because there’s so much info out there already and not being a doctor or health care professional I acknowledge that I can’t add anything insightful or new :) However, once I decided to look in to colon cleansing last year, I did a lot of reading about it and read a lot of people’s experience before I did it and wanted to share. I starting thinking about it because I met Rachelle Starr, a wonderful beautiful soul who, with Tyler Tolman operates a company called Conscious Lifestyler. They have a 30 day detox challenge which starts off with a colon cleanse, followed by 26 days of eating their amazing raw vegan superfood called Pulse, which is a “100% raw, activated food designed to maximize the absorption of nutrients to lead to better all-round health” (which just happens to be totally delicious – read more here). After six months of being raw vegan I had already gone through some detoxification simply by changing my diet but wanted to take it further. So, having done my research on colon cleansing, reading about Tyler’s description of your colon being a ‘river of life‘ and looking into research done by Tyler’s father Don Tolman (who is a bit of a heavyweight in the nutritional eating field to say the least)… I decided to take the challenge. Honestly, the first colon cleanse was difficult. It takes four days of drinking the bentonite and psyllium mix five times a day every two hours, four days of drinking lots of water, and four days of no food! And without going into detail, you definitely need to be at home towards the end of it, not at a Scissor Sister’s concert like I was…! All the difficulties were totally worth it though. My skin proceeded to clear up – something that hadn’t yet happened through the diet changes, I felt lighter and had more energy, I didn’t feel the need to eat all the time and (almost most importantly) I felt like I had accomplished something! The second time (and now hopefully the third which I’m doing today), was all over in one day and certainly not as traumatic and surprising as the first time. And a very rewarding way to spend the day in my opinion. Rachelle and her friend Therese (who is also a beautiful wonderful soul) did a video on two different ways to mix up the cleanse – I’m with Therese, I like to drink it but you can also eat it as a porridge. this siote needs much more attention. I’ll probably be back again to read more, thanks for the information!